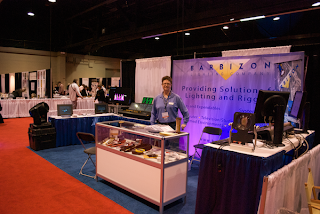 SETC was just a couple weeks ago in Lexington Kentucky and Barbizon Lighting Company was there! SETC or the Southeast Theatre Conference is one of our favorite trade shows and events of the year. Each year brings new bright eyed lighting and design students as well as old and dear friends and customers to the annual conference in the Southeast part of the states. In our booth we had a plethora of control and LED options on display and available for demo. Stating off with the higher end of control, we had the grandMA 2 Full Size desk on display connected to the grandMA 2 3D visualizer showing off some advanced control options an moving light training. 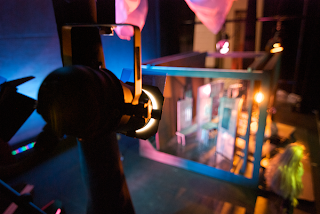 Also connected to the grandMA 2 was Vari-Lite's latest product, the VLX LED wash light. On the opposite side of our booth, we demoed ETC's Element lighting desk which was connected to a couple of Altman's Specta Cyc LED fixtures and ETC Selador LED fixtures. Something else that we had on display is a new white LED fixture that is still in prototype from The Light Source. While we would love to mention more about it here, it is still in development and is expected to be released in the very near future. Keep your eyes open for more information soon. 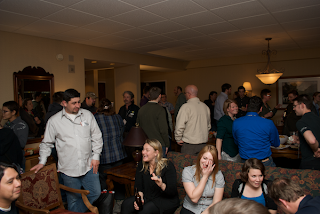 SETC kicked off Wednesday night with the Annual Tech Mixer which was sponsored by Tom Cat Truss this year. The tech mixer gives students a chance to meet their fellow tech and design students as well as educators and manufacturers attending the show. During the course of the Mixer almost all of the exhibitors at SETC donated give aways to lucky winners. Babizon was honored to be included by giving away one of the best and industry favorite lighting tools, the Ratcheting Light Wrench, a $40 dollar value! One of our favorite sessions at SETC had to be Kenton Yeager from University of Tennessee Knowxville's Light Lab Demo and Workshop which was being held right outside of the exhibit hall. Kenton worked closely with our Charlotte office to spec and build a 1/6 model and working "theatre" light lab to demonstrate different lighting angles and color choices as well as including different technologies such as LEDs and even miniature moving lights. Students and educators learned about how Mr. Yeager constructed and organized the lighting lab and the benefits of having and using a scaled light lab during the design process. On Thursday and Friday night, Barbizon hosted a reception in our suite at the Hilton Hotel to say thank you to our valued customers and manufacturers for their years of support. Our reception was well attend and gave everyone a chance to mingle, talk exchange ideas before heading off to dinner. It was a real treat to see old and new friends as well as meet some of the up and coming students in the lighting and design industry.